Wonder Woman is a fictional superhero who appears in comic books published by DC Comics. The character is a warrior princess of the Amazons (based on the Amazons of Greek mythology) and is known in her homeland as Princess Diana of Themyscira. When outside her homeland incognito, she is sometimes known by the secret identity Diana Prince. She is gifted with a wide range of superhuman powers and superior combat and battle skills. She possesses an arsenal of weapons, including the Lasso of Truth, a pair of indestructible bracelets, a tiara which serves as a projectile, and, in some stories, an invisible airplane. Wonder Woman was created by the American psychologist and writer William Moulton Marston. The character first appeared in All Star Comics #8 in December 1941 and first cover-dated on Sensation Comics #1, January 1942. The Wonder Woman title has been published by DC Comics almost continuously except for a brief hiatus in 1986. 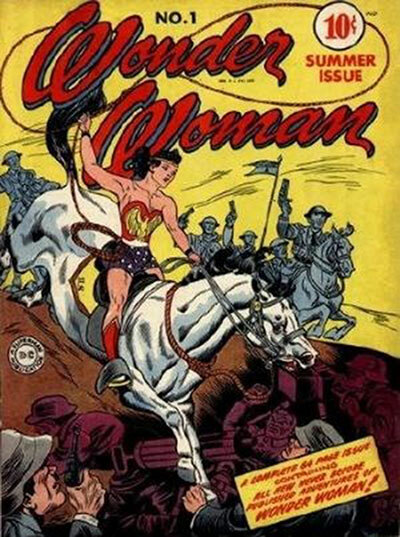 Her depiction as a heroine fighting for justice, love, peace, and sexual equality has led to Wonder Woman being widely considered a feminist icon. Created during World War II, the character was initially depicted fighting the Axis military forces, as well as an assortment of supervillains. Wonder Woman gained a formidable cast of enemies bent on eliminating the Amazon, including classic villains such as Cheetah, Ares and Circe, and newer ones like Genocide and The Circle, as well as many gods and monsters from Greek mythology. 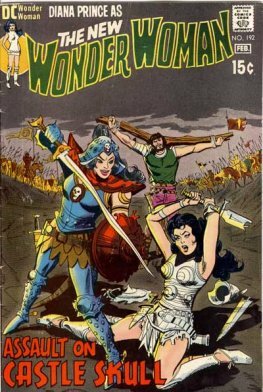 Wonder Woman has also regularly appeared in comic books featuring the superhero teams Justice Society (from 1941) and Justice League (from 1960). In addition to the comics, the character has appeared in other media; most notably, the 1975–1979 Wonder Woman TV series starring Lynda Carter, as well as animated series such as the Super Friends and Justice League. Since Carter's television series, studios struggled to introduce a new live-action Wonder Woman to audiences, although the character continued to feature in a variety of toys and merchandise, as well as animated adaptations of DC properties, including a direct-to-DVD animated feature. Attempts to return Wonder Woman to television have included a pilot for NBC in 2011, closely followed by another stalled production for The CW. In 2013, Warner Bros. announced that Israeli actress Gal Gadot would portray Wonder Woman in the 2016 film Batman v Superman: Dawn of Justice.